This project was created on 01/22/2019 and last updated 2 months ago. The ESP32 WiFi robot is a shrunken-down version of the ZeroBot (https://hackaday.io/project/25092). Instead of a Raspberry Pi, it is powered by the similarly popular ESP32. Despite its lower processing power, the ESP32 robot has a ton of features. It streams color video over WiFi, runs on a small LiPo battery and can be controlled accurately from any web browser. With the 4€ Esp32 and a 3€ camera, it&apos;s also really cheap. The ESP32 requires no app, it can be controlled from any PC or mobile device that has a web browser. Unlike with other browser based robots, the web interface uses a virtual analog stick, which works accurately with any touchscreen or mouse. Even keyboard input is accepted. The streaming resolution can be considered potato-quality at 160x120px. It still surpasses the Gameboy camera and has 8-bit color. The robot can be used in access point mode or it can connect to an existing WiFi router. 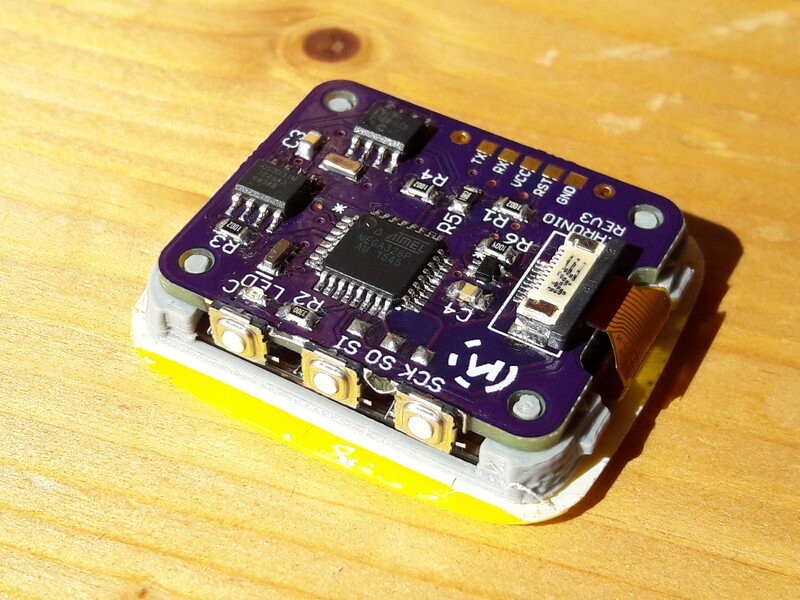 A single cell LiPo battery powers the robot and can be recharged from a micro USB port, which is also used to program the ESP32. Additional features include temperature and battery voltage monitoring and a bright LED output. To make the robot as compact as possible, the components are soldered to a custom PCB. If you are interested in this robot and want to build it yourself, be warned that the development is not 100% complete. The Zerobot (Pro) might be a better beginners project. Hi again, I am in Brazil and have no ways to get this PCB done. So, as in my previous question, i would like to use modules I can buy locally. I also have no 3D printer so size is not an issue. Python is needed to convert the website file from HTML to a single string and back. Where can I find instructions on how to deal with this conversion. Hi, I would like to assemble this robot with discrete modules. How can I get the modules diagram? I have completed the assembly of the board and Arduino or my PC does not recognize it when I plug in the USB connection. Can you give me any trouble shooting suggestions? The red led lights up and voltages that I see on the board view are all there and correct. Sorry for reponding so late, Hackaday.io&apos;s feed is not working for me. OK, so you should start with the FT232. If the board lights up, that&apos;s good sign. That means there might be a problem with the FT232 itself or maybe just bad solder joints. Can you post a picture? I bought two of everything as I intend to make another one. This is my first experience with SMDs that are this small, I bought the stencil and used low temp solder paste and used my SMD hot air repair to set them. I have a picture but don&apos;t know how to post it. There is a bug on ESP32 hardware design: the camera&apos;s reset pin didn&apos;t attach to ESP32 EN pin, the floating reset are randomly reset camera, that&apos;s makes VTX are lagged and become color strips. Good find! Seems like I forgot to pull that pin up. Have you tested this? It&apos;s working fine for me with the pin floating. Yes, it becomes smooth when pull up the reset pin. How do I order the board from Aisler? You need to take the .brd file from Github and upload it to Aisler. I found this : https://www.hackster.io/pdub/long-range-cellular-robot-earth-rover-afe16a : this project seems to achieve my goal,except for the case,that I really don&apos;t like it. the case of esp32 robot is much better and because I want to power the robot with a solar panel,instead of use so large batteries. I think that you greatly underestimate the amount of energy that wireless communication and motors require, and greatly overestimate the amount of energy such a tiny solar panel can provide. Your robot would probably need to spend a whole day charging just to drive a few meters. Hello. Is hard to add to this little robot a GSM module and a SIM card instead of the WIFI module ? And a fotovoltaic panel on the top ? I would like to drive it along the roads of my city,while I stay at home and I can&apos;t do it if it has a wi-fi module,because where I live there are no wi-fi hot spots. I think that will be very funny to drive it without time and energy limitations. Using a GSM module would probably work but I don&apos;t know about the bandwidth of these things. Streaming video uses a lot of data, so you would need an unlimited data plan. This might be more expensive than the robot itself. I have a mobile carrier that give to me 30 GB for 6 euros every month. What about the fotovoltaic panel on top ? Which part of the robot should I change if I remove the wi-fi module and I add the gsm module ? which gsm module u suggest ? and how change the operating system of the robot ? There are off the shelf boards for solar charging, e.g. from Adafruit. I have not used GSM modules before. You probably would have to rewrite most of the code from scratch if you are not using the ESP32. It might be easier to use a mobile hotspot that creates its own wifi network and connects to the mobile internet (e.g. huawei E5330). This way you can use the ESP32 with the available code. What do you think? Maybe it&apos;d still be bigger because you&apos;d still have to get the motor driver modules in there somehow?... In any case, I&apos;m seriously looking at putting one of these together, just thought you might be interested in that module. Thanks for sharing your work! I was considering using this board for the robot. But when I started the project, the CAM board was still very new and had no Arduino IDE support. Now that&apos;s changed. The motor driver, USB bridge and battery charging need to be added, but the ESP32-CAM seems very promising. Especially with the small OV2640 that can output compressed jpg. I&apos;ve already ordered the board, when it arrives I will try to port my software to it. I just tried the ESp32 cam board and it&apos;s great. Because of the compression it streams at much higher resolutions. However at the moment I don&apos;t have the time to continue with the project. I&apos;m new here (yes there are still many people who do not know that this cool site exists),and I would like to know if I can buy the fully working product,since I&apos;m not an engineer. thanks. Sorry, but there is no kit. You will have to acquire and assemble the parts yourself. yeah I could do it only if there are no parts that should be soldered. Your prints look great. What model is your 3D printer? Thanks. Same thing on Banggood. I just don&apos;t know the exact RPM. Hobbyking only states the gear reduction of 75:1. Very clean design. I love it and see very little to improve... the fact that it uses the ESP32 is an excellent excuse to integrate it to ROS and leverage a proper computer for the image processing/heavy computation. I&apos;d love to build one if it had wheel odometry and an IMU, that would allow it to be made autonomous. Hi there. How much would it cost to buy the PCB with Component from you? The the camera board an off the shelf part you soldered on at a right angle? Love the board to board routing how ever it was done. Would love to see more detail pictures of that part. Yes, the PCB is soldered directly to the camera board to reduce size and cost. Thanks, the code is already available on GitHub. Just follow the link on the project page. This is great! I love that it&apos;s so simple but such a sleek design. Looks like a great project to tackle with the kids. And the virtual analog stick is a nice touch. Great job! You are about to report the project "ESP32 WiFi Robot", please tell us the reason.